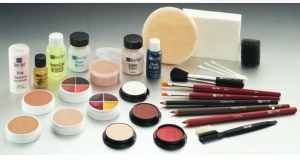 Theatre makeup equipment and make-up kits for small theaters, lay stages, carnival, etc. 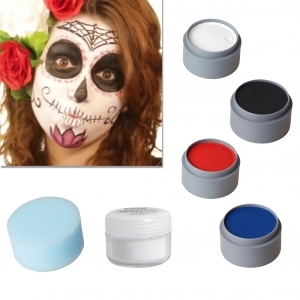 This makeup for professional makeup of SUGAR SKULL SPAIN . The colors and the accessories is sufficient for several applications . 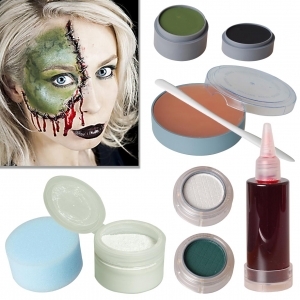 The kit includes professional Halloween makeup : 1x Water Makeup Box 15 ml Color: 001 1x Water Makeup Box 15 ml Color: 101 1x Water Makeup Box 15 ml Color: 501 1x Water Makeup Box 15 ml Color: 304 1x Polyester Glitter 5 ml Color: PG - 27 1x makeup sponge Water make-up is stirred with water . Is dried smudge-proof on the skin . 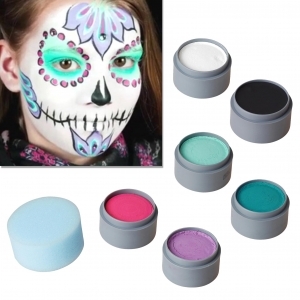 This makeup for professional makeup of SUGAR SKULL . 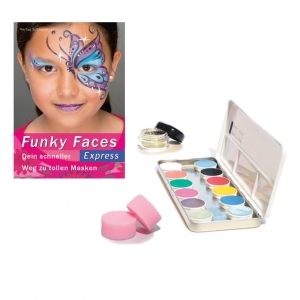 The colors and the accessories is sufficient for several applications . 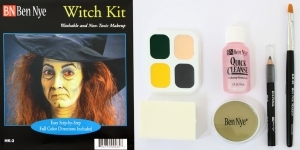 The kit includes professional Halloween makeup : 1x Water Makeup Box 15 ml Color: 001 1x Water Makeup Box 15 ml Color: 101 1x Water Makeup Box 15 ml Color: 602 1x Water Makeup Box 15 ml Color: 402 1x Water Makeup Box 15 ml Color: 405 1x Water Makeup Box 15 ml Color: 508 1x makeup sponge Water make-up is stirred with water . Is dried smudge-proof on the skin . This makeup for professional makeup of ZIPPER FACE . The colors and the accessories is sufficient for several applications . 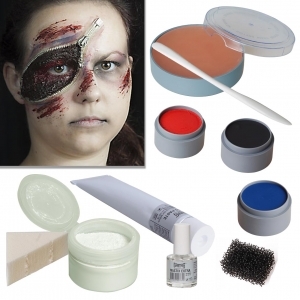 The kit includes professional Halloween makeup and accessories : 1x Cream Makeup Box 2.5 ml Color: 505 1x Cream Makeup Box 2.5 ml Color: 101 1x Cream Makeup Box 2.5 ml Color: 301 1x Transprarentpuder 40 gr 1x Derma Wax 60ml 1x Dermawachsspatel 1x blood paste 1x mastic adhesive skin 1x latex sponge 1x Stubble Sponge (Not included in the set ) need a commercial zipper . This makeup for professional makeup of CRACKED DOLL . 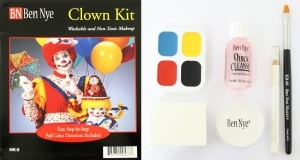 The colors and the accessories is sufficient for several applications . 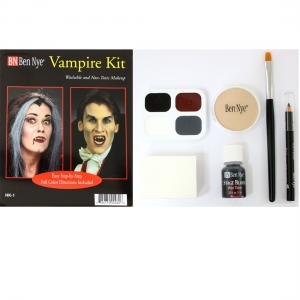 The kit includes professional Halloween makeup and accessories : 1x Water Makeup Box 15 ml Color: 001 1x Water Makeup Box 15 ml Color: 101 1x Water Makeup Box 15 ml Color: 301 1x Water Makeup Box 15 ml Color: 505 1x makeup sponge 1x Lash Adhesive 5ml 1x full lashes No.2 Water makeup is stirred with water . Is dried smudge-proof on the skin . 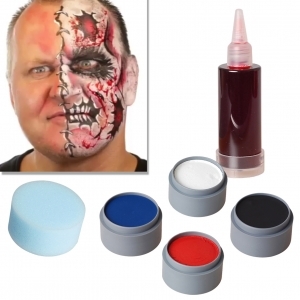 This makeup for professional makeup of CARTOON ZOMBIE . The colors and the accessories is sufficient for several applications . 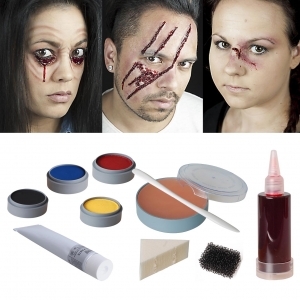 The kit includes professional Halloween makeup and accessories : 1x Water Makeup Box 15 ml Color: 001 1x Water Makeup Box 15 ml Color: 101 1x Water Makeup Box 15 ml Color: 301 1x Water Makeup Box 15 ml Color: 505 1x makeup sponge 1x Film Blood B 100ml Water make-up is stirred with water . Is dried smudge-proof on the skin . 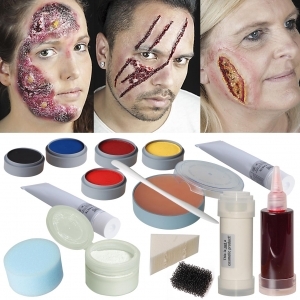 This makeup for professional makeup of FRANKENSTEIN`S BRIDE . The colors and the accessories is sufficient for several applications . 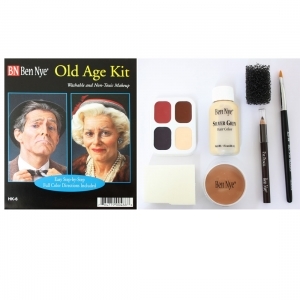 The kit includes professional Halloween makeup and accessories : 1x Water Makeup Box 15 ml Color: 404 1x Cream Makeup Box 2.5 ml Color: 101 1x Eyeshadow Pearl Color: 704 1x eyeshadow color : 487 1x Translucent Powder 40 gr 1x Dermawachs 60 ml 1x Dermawachsspatel 1x makeup sponge 1x Film Blood B 100ml free: 1x Theme Template Water make-up is stirred with water . Is dried smudge-proof on the skin .